Outside the Royal Palace of Neutrino, Zak and Raph hold the line with the rest of the Neutrino Resistance Force, but Krang’s Rock Soldiers are a formidable force. Inside the palace, Leo, Mike, Dask, Kala and Princess Trib continue their assault on Krang and Tragg. The Neutrinos secure King Zenter and Queen Gizzla and Leo succeeds in chopping off Krang’s right arm (or his robot body’s, anyway). Krang is not to be trifled with, however, and effortlessly swats both Turtles away. Back at the NRF Command Center, Don, Felix and the Fugitoid put the finishing touches on the END Missile. Don and Honeycutt have a heart-to-heart about science and spirituality. Honeycutt explains that the teleportation device doesn’t actually send an individual across space on a physical level, but destroys the original and then recreates them atom by atom at the destination. And yet, the soul is transported across all of creation to sync up with the copy regardless of having no quantifiable physical being. Honeycutt tells Don to reconsider his incredulity toward his status as a reincarnation, as even though there’s no proof the spirit exists, that shouldn't discount belief in it. Outside the palace, Raph and Zak have the Rock Soldiers on the ropes when suddenly Krang unleashes a giant robot bearing his holographic likeness for a head. On Burnow Island, guards enter the cryo-stasus chamber and find a dead Utrom and an empty ooze pod. They scramble to track down the culprit, but Karai has already made her escape with the ooze via airlift. Inside the palace, the Turtles aren’t making any progress in taking down Krang, though the royal family (Trib especially) are impressed by their valor. Outside, Zak gets a message from his fellow NRF troops that they backup against the giant robot. Zak figures they’d need more than backup; they'd need a miracle. As it happens, the END Missile has been launched and is heading toward the battle (with Don and the Fugitoid trailing behind it in an aircar). Inside the palace, Tragg shoots Dask in the arm, taking him out of the fight, and in the confusion, Krang takes Mike hostage. The END Missile arrives just in the nick of time and neutralizes the unique frequency used by all of the Rock Soldiers’ weapons. The Rock Soldiers surrender and Raph, grabbing a rocket launcher, wastes the giant robot. Don, the Fugitoid and the rest of the NRF storm the palace and tell Krang to stand down. Krang has a surprise for them: His robot body doesn’t operate on the same frequency as his soldiers’ weapons. Krang tells the Fugitoid to surrender or else he will kill Mike. Honeycutt willingly does so, but tells Don to fight against the coming Technodrome. Krang, Tragg and Honeycutt then teleport to Burnow Island. Though they’ve lost Honeycutt, they’ve saved Neutrino. For that, the Commandos and the Royal Family thank the Turtles for all their help (with Mikey getting a kiss from Princess Trib). Down in the lair, April finally gives up hope that she’ll ever see the Turtles again. Casey tries to reassure her and the two begin to kiss. 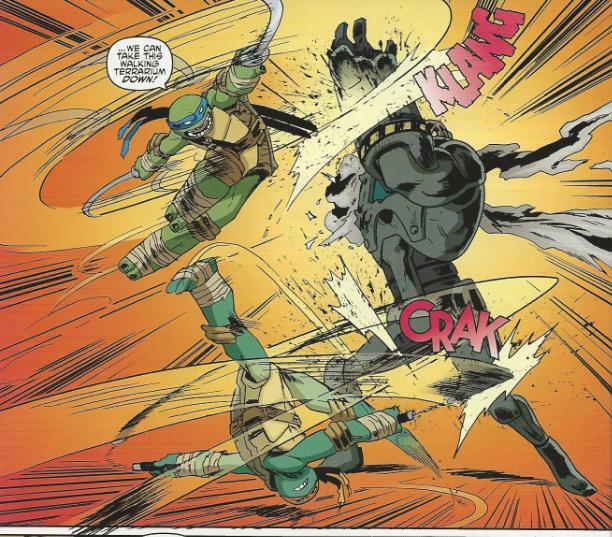 Suddenly, the Turtles arrive via teleportation and reunite with April, Casey and Splinter. 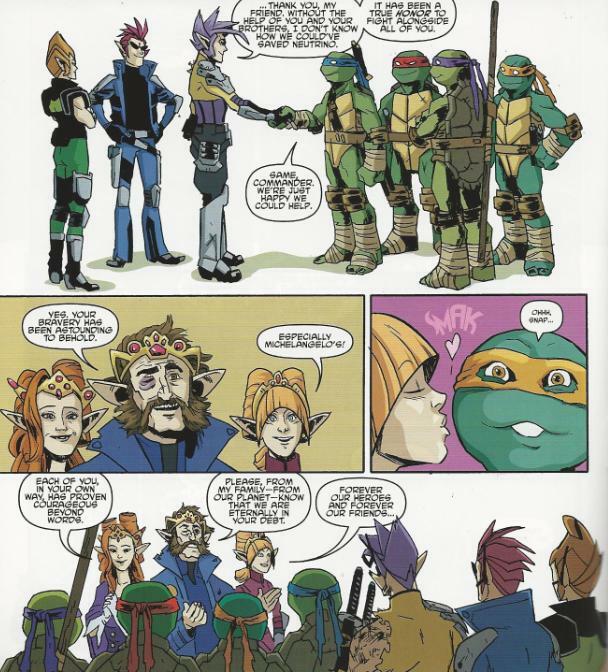 *This issue is continued from TMNT (IDW) #19. 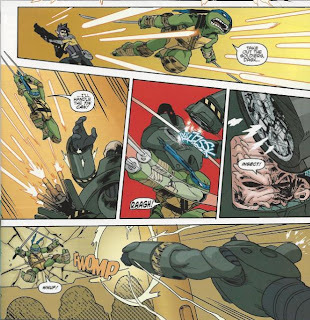 The story continues in TMNT (IDW) #21. 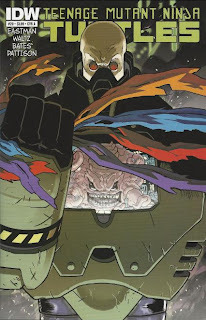 *Krang's story continues in TMNT Villain Microseries #1: Krang. *The Secret History of the Foot Clan miniseries takes place between this and next issue. *Mikey references their battle against Slash in TMNT(IDW) #16. *This issue was originally published with 3 variant covers: Cover A by Bates, Cover B by Eastman and Pattison and Cover RI by Langdon Foss. *This issue also contained 3 bonus sketches by Ben Bates. So the Krang War is over. A bittersweet conclusion, as the Turtles saved the royal family and Neutrino but essentially lost the most important part of the battle: The Fugitoid. Since Honeycutt is the key to completing the Technodrome, a device designed specifically to eliminate humanity and terraform the Earth… Yeah, that’s not really much of a victory. Well, I mean, yeah, they saved all those lives, but GAW. What-EVAR. In this issue, Krang puts up the fight I felt the Shredder should have put up in TMNT (IDW) #12. The Turtles get their licks in, but Krang stands resilient to all their attacks and swats them away like pesky insects. This was their first encounter and he essentially wins the battle, beating them in combat, outthinking their strategy and getting exactly what he wanted. In my opinion, this is how a first throwdown with a major villain should go; if the heroes defeat the antagonist too easily on their first outing, it effectively diminishes the threat. Anyway, the manner in which Honeycutt reveals that the originals are destroyed in teleportation and a copy is constructed seemed rather nonchalant. Likewise, Don seemed to accept the fact that his original died back in Central Park and he’s nothing but a clone fairly well, too. Of course, Honeycutt softens the bombshell with his theory that the soul follows the data across the universe to be revived within the copy’s body… But dude. THEORY. “Consciousness” and “soul” aren’t necessarily the same thing. Just because the copy retains all the memories and personality traits of the original doesn’t mean the original didn’t die. I mean, I know that you and I aren’t made up of the same atoms we were born with and we’re essentially “copies” and not the originals, but that doesn’t mean we all died at some point in the past (the replacement of atoms over a lifetime is a gradual process while the teleportation tech is an instantaneous thing, so…). We’re saying good bye to Ben Bates with this issue, unfortunately. I really, really enjoyed his stuff and was hoping he’d stick around for more than one arc, but his duties regarding the Sonic the Hedgehog/Mega Man crossover at Archie called him away. To date, I think he’s drawn the best Krang (his irritated expressions during his fight with Leo and Mike were superb). My eyes may be playing tricks on me, but whenever Bates did a close up of one of the Turtles, he showed their bandanas to be torn and ragged around the eyes in a fashion that seemed similar to their individualized looks in “Secret History of the Foot Clan”. 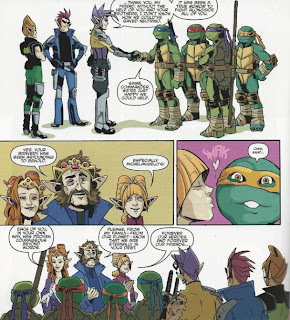 Since “Secret History” takes place right after this arc, that’d be a neat way of explaining the unique bandanas the Turtles are all suddenly wearing. Or maybe I’m just seeing things, I dunno. 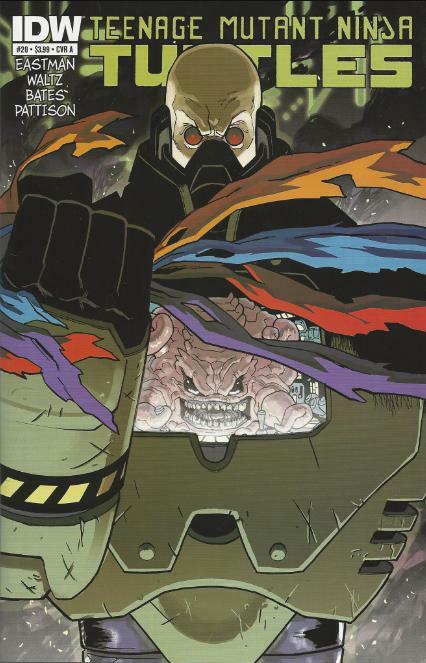 On the whole, I think the Krang War arc was a bit bumpy in the pacing department, but I can’t deny that I really enjoyed it. It broadened the mythology of this new TMNT universe and utilized ideas from the old cartoon that were quite frankly squandered by that show’s lack of ambition. I think this long-awaited showdown with Krang was more satisfying than the showdown with Shredder and I’m still excited to see where the Krang arc goes next. Wow... that whole thing of having yourself die and a clone created in your place when you get teleported elsewhere just blew my mind. I'd never be able to watch Star Trek the same way again, even though the thought did cross my mind as how weird it is to somehow be broken down into molecules and atoms and whatever and be reassembled elsewhere. That would be interesting for people with fatal diseases. Imagine with some tinkering in that sort of technology, people with cancer can be teleported wherever and their clone self would be duplicated minus the cancer. Nice Review, but I don't really think Fugitoid was being literal about how the teleporter works, he was just trying to get his point across to Donnie. The Neutrinoes (or any other race) wouldn't be so nonchalant about teleporting if that were really the case. Doesn't this theory of teleportation follow from Star Trek? I could have sworn that one of the characters even especially loathed the concept for this very reason. It's possible, but I've never really watched watched Star Trek. But in all the media I've seen involving teleportation (Justice League, the Fly movies) they never touch upon the "copy-kill" scenario. Well, except for that Canadian cartoon I mentioned in the review, but I can't find the damn thing anywhere. Michael Crichton's Timeline introduced me to the copy/destroy concept, though it was a matter of sending the data through some sort of dimension/time jargle I don't quite remember rather than space. It even brought up problems with the copies not being assembled properly on the other side.